Monroe County contains 456 square miles (291,840 acres) of land and is home to 14,642 citizens. There are 119 industries in the county, with the median household earning an income of $37,080. Major employers include businesses in the sectors of extraction of oil and natural gas, alumina refining and primary aluminum production, and state and local governments. The land resources of Monroe County provide many economic benefits. The county's 630 agricultural farms produce cattle and calves, dairy and milk, and oats and hay, among others. Over 90,000 acres of land are in farms. An abundance of forested acres are also present in Monroe County. Responsibly managing these woodlands provides community support by producing economic activity in four forest industrial sectors. These businesses directly generate $10.8 million in industrial output and $715,000 in taxes. This fact sheet presents some key terms and figures for describing the many contributions Monroe County's forests and forest industries provide to the local economy. Forest Type Group: A classification of forest land based on the species forming a plurality of live-tree stocking. Forest types sharing closely associated species or site requirements are often combined into major forest type groups. 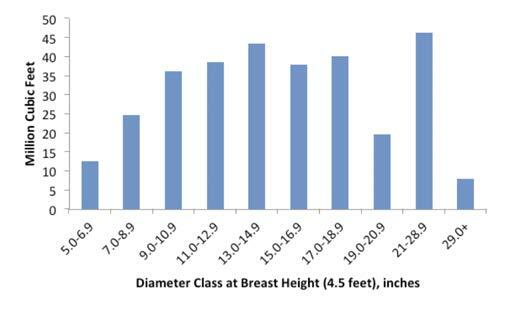 Growing Stock Volume: Net volume, in cubic feet, of growing-stock trees 5.0 inches in diameter and larger, measured at breast height (4.5 feet). Height is recorded from a 1-foot stump to a minimum 4.0-inch top diameter outside bark of the central stem, or to the point where the central stem breaks into limbs. Gross volume minus deductions for cull equals net volume. Sawtimber Volume: Net volume in board feet, by the International ¼-inch rule, of sawlogs in sawtimber trees. Gross volume minus the deductions for rot, sweep, and other defects that affect use for lumber equals net volume. Employment: The total wage and salary and self-employed jobs in a geographical area. This number includes both full- and part-time jobs in an industrial sector. Direct Federal Tax Impact: Taxes collected by the U.S. government. These taxes are generated from labor income, indirect business taxes, households, and corporations associated with the industry of interest. Indirect Business Taxes: These taxes are primarily sales and excise taxes paid by individuals to businesses through normal operations. They do not include taxes on corporate profits and dividends. Why should I manage my woodland? You are able to obtain cost share funds to establish your woodland, tax credits while managing your forest property, and preferable tax treatment at harvest. Search Ohio State University Extension's website Ohioline for further study of forestry-related topics: ohioline.osu.edu. Contact your local service forester to help you develop a management plan for your property. Figure 2. 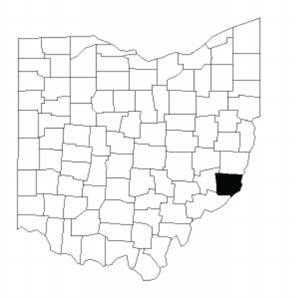 Monroe County is located in Ohio's southeastern timber price reporting region. Figure 3. Monroe County contains approximately 200,000 acres of forestland, which is two-thirds of the total land cover[1, 5]. Figure 4. Monroe County's forests are 86.2% privately owned, over 170,000 acres. Figure 5. Oak/hickory is the predominant forest type within Monroe County. Figure 6. Growing stock volume by 2 inch diameter class. Monroe County's forests contain 300 million cubic feet of growing stock. Figure 7. 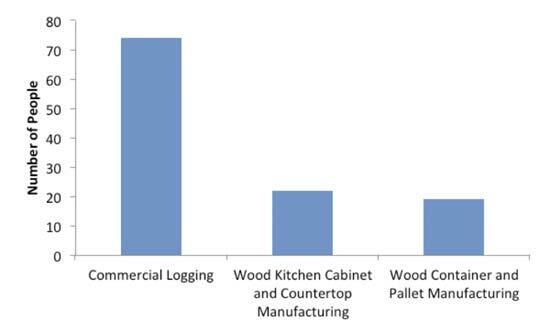 Sawtimber volume by species group. Monroe County's forests contain 1.1 billion board feet of sawtimber. Figure 8. Industrial production values of the top agricultural and natural resources products in Monroe County, 20101. Figure 9. Direct economic impact of Monroe County's forest industries, 2010. Labor income, value-added and industrial output are represented on the left Y-axis, and employment is represented on the right Y-axis. Figure 10. Monroe County's top forest industry employers by sector, 2010. Figure 11. Direct tax impact of Monroe County's forest industries, 2010. United States Census. 2010. United States census quick facts. quickfacts.census.gov/qfd/states/39/39007.html. United States Department of Agriculture National Agricultural Statistics Service. 2010. Ohio county summaries. nass.usda.gov/Statistics_by_State/Ohio/Charts_and_Maps/index.asp. United States Forest Service Forest Inventory and Analysis Database. 2010. apps.fs.fed.us/fido/standardrpt.html. We thank David Apsley, Ohio State University Extension; Nathan Irby, Mississippi Forestry Association; John Lusk, Ohio certified tree farmer; and Dave Schott, Monroe County SWCD, for their reviews of this fact sheet. 1All other crop farming includes (1) growing crops (except oilseeds and/or grains; vegetables and/or melons; fruits and/or tree nuts; greenhouse, nursery and/or floriculture products; tobacco; cotton; sugarcane; or hay) or (2) a combination of crops (except a combination of oilseeds and grains; and a combination of fruits and tree nuts) with no one crop or family of crops accounting for one-half of the establishment's agricultural production (i.e., value of crops for market).